HexFest: Vendors and Presenters Meet and Greet for 2019! HexFest attendees will love the magical shopping in our on-site vending hall—located within the Orleans Ballroom—where you can purchase powerful ritual tools, signed books, exquisite jewelry, and spellcrafts handmade by true practitioners. Each vendor is a presenter so our vending area also serves as our presenters’ meet and greet, where you can speak with your favorite authors and practitioners between workshops! The ballroom is located on the second floor of the hotel and is accessible by both stairs and elevator. As a special bonus for HexFest attendees, we will be offering free psychic readings both days of the festival in the Orleans Ballroom vending area! Click here to sign up for a vending table and join in the magic of HexFest! Charmed By Starr.com is a Most Spellbiinding Place to Visit. Home of the Crafty Witches, an online store specializing in handcrafted, hand designed items for discerning Witches who are ever evolving. We are creators of Journey to the Realm of the Underworld Graveyard Kits, Chronic Pain Oil, Starr's Wicked Hot Sauce and so much more. View our full line of witchy items. If you do not see the item you need, please do not hesitate to contact us and we will do our utmost to fulfill your requests. Talismanic jewelry, meticulously chosen palm stones and crystals, handmade charms and other Witchy wonders, all created or curated by Sandra Mariah Wright. The official shop of HexFest will also be represented by a vending table. Whether you want a handmade candle to bless your home, herbs to mix up your own magic, a real love potion, books on the arts of Witchery, or a Voodoo doll crafted by a true practitioner, Hex is for those who believe in magic and those whose hearts beat with its fire. 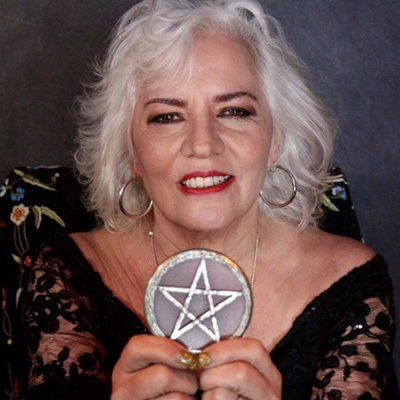 Magickal Realms will be offering books signed by Lady Rhea as well as her own New York City style spell candles, her unique blends of magickal oils, and her custom-designed magickal pendants. My books will be available to purchase, as well as some of the products in my small product line. Those products may include but are not limited to The Energy Trap Kit, Rue Oil, Dark Moon/Dark Sun Vervain Oil, Mugwort Oil and a selection of talismans. Featuring the myth-inspired esoteric art of Laura Tempest Zakroff, including original works, fine art prints, notecards, apparel, and more. The premier source of wholesale metaphysical, pagan & fantasy jewelry & gifts in the us since 1995, Starlinks offers the most exceptional and unusual pendants, charms, greeting cards, & unique gifts available in the market. They are a wholesale only company, bringing some special wares to feature at Hexfest so if you have a retail website or brick and mortar shop, be sure to ask us about setting up an account! Since 2006, we've followed our dreams, starting out as a small private practice in a Berkeley office. We are now based in Mt Shasta, where the beauty of nature and the excitement of thousands of annual spiritual pilgrims bring us joy. We thrive when we are exploring the world and making connections with fellow mystic travelers, and we bring that spirit to our work with you. Readings, crystals, potions, teas, and more. A small selection of books for sale. Titles flexible. Special requests: PM me at Face Book 6+ weeks before and I will have on site. Sacred Stone Oracle Readings: 3 Stones ($10): Your choice: Past, Present, Future; Current Situation, Challenges, Advice; Think, Feel, Do; Helps, Hinders & Potentials. 5 Stones ($15): Health, Work, Relationships, Obstacles, Supports. 7 Stone Reading ($20)Spiritual Guidance: Self, Motivation, Uncertainties, the Unseen, Advice, Next steps, Possible results. Wicked Witch Studios provides elegant and effective magical supplies and accoutrements to practitioners of discriminating taste, and offers candles, oils, special edition magical sprays, gorgeous Victorian-era inspired poppet pins and candle inscription tools, and hard-to-find items essential to a well-rounded practice. While you may not find everything you're looking for, one thing's for sure: You certainly won't find anything even remotely tacky! Witch Way Magazine is a magical magazine aimed at providing both traditional and modern perspectives on spiritual growth, development, and most importantly - a little campy fun!